Brother and sister Jik and Nora are bored and angry. Why does their Dad spend so much time since their mother’s death drinking and ignoring them? Why must he come home at all hours and fall downstairs like a fool? Nora goes to church and lights a candle. The cross-looking sailor saint she particularly likes seems to grow enormous and come to life. Nora is too frightened to stay. Nora and Jik go down secretly to their father’s boat, the Lady Molly, at Howth Marina. 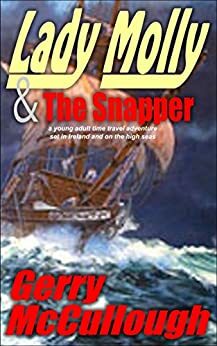 There they meet The Snapper, the same cross-looking saint in a sailor’s cap, who takes them back in time on the yacht, Lady Molly, to meet Cuchulain, the legendary Irish warrior, and others. Jik and Nora plan to use their travels to find some way of stopping their father from drinking – but it’s fun, too! Or is it? When they meet the Druid priest who follows them into modern times, teams up with school bully Marty Flanagan, and threatens them, things start getting out of hand. This Young Adult time travel adventure takes Nora and Jik back to several periods in Irish history, visiting the warrior Cuchulainn, the pirate Grainne, the days of St. Patrick in early Christian Ireland and an Irish famine ship – interlinked with modern teenage life and romance in the busy Irish capital, Dublin. It deals with themes of neglect, alcohol abuse, bullying and the death of a parent/spouse. The children also learn several important lessons as they go about their adventure. 5.0 out of 5 starsAn exciting adventure of time travel on the Irish high seas. This children's tale of high adventure is a lovely warm story. Filled with plenty of action it still carries the subtle messages of friendship and the importance of family relationships. I'm sure kids and young adults alike would enjoy Lady Molly. It's written in excellent prose to suit the intended audience and has enough antics to keep any young mind turning the page. 5.0 out of 5 starsDelightful & touching adventure. Lady Molly &the Snapper is a delightful YA adventure that is both entertaining and educational. The characters are well crafted and loveable. Jik and his sister, Nora, are fed up of being left alone by their father while he drinks his troubles away at the pub. They understand that he’s mourning the death of their mother, and vow to find a way of boosting his self-esteem in the hope that he will stop boozing his life away. The answer comes in the shape of the Snapper who helps them go back in time in search of a precious family heirloom. Their adventures on the high seas brings them face to face with the famous Irish characters that have populated their family stories, and the sufferings endured by the victims of the terrible potato famine of Ireland. This story goes beyond the exciting adventures of two children aboard an ancient ship in the tumultuous seas – it presents the loneliness of children dealing with the death of a parent, and the emotional damage caused by parental neglect. A great read for parents as well as children alike. 5.0 out of 5 starsSimply Magical!!!! A spellbinder. A young adult fantasy and adventure book that tells the story of teenagers Jik and Nora who time travel on the Lady Molly boat, meeting and having adventures with major historical figures, most notably Cuchulain, lady pirate Grania, Maewyn (St. Patrick). They are bored and angry because their father Da drinks, the children's mother, his wife has died and has no time for them. Well written, the story set in modern day Dublin flows in authentic Irish lilt and dialogue, captures the imagination. The plots weave and twist with adventures, fantasy rescues, a story of bullying, Nora's love interest Sean, Nora's conflict with Bridie, the father's love interest and the strange disappearance of Nora's diary. A rollicking tale with a happy ending.